Back row: Tug, Tanner, Esjae. Middle Row: London, Garry, Trena, Germany and Joey. Front row: Jake, Eddy and Columbia. Trena was still in the recovery room after delivering their fourth baby when she began telling Garry she wanted more kids. Garry, trying to recover himself, from the past eight years of babies in diapers for all but three weeks of that time, protested loudly but to pacify her he told Trena, "No more," and added, without much thought, "we'll adopt some." Garry's words were prophetic because in a few years, both of them were seriously considering adopting children - not a child but children. Garry and Trena Eiden began the search for what they wanted - siblings who could grow up together .The Eidens now have nine children and very little spare time so in order to interview Garry and Trena, I needed to talk to them while they were cutting up their wild meat. Garry's first comment was, "We take our hunting seriously these days." Trena's was "It's not cheaper by the dozen!" Cutting their meat was obviously a family project. The older Eiden boys were quartering and bringing the meat into the dining room where a board and paper covered their huge dining room table. When the boys finished, they helped Mom and Dad clean and cut the meat that was to be canned or made into hamburger. The younger boys were taking care of the hide and scraps. London was making shortbread cookies for a church youth gathering later in the evening. Throughout the interview, their story reinforced what I could see from a tour of their house. Trena and Garry are organized and make time and resources productive. A storeroom stocked with staples and home canned food, a basket for each child in its own niche in the laundry room, storage room used efficiently, and the cooperation of each person in completing their chores all contribute to a well organized household. Garry and Trena make certain that the entire family take part in work and recreation. By the time London was eight years old, Garry and Trena had made up their minds to adopt several children. The first requirement was to allow an in-depth home study. Then began the long tedious paper and foot work to find children who would fit into their family. Not an easy project at best, Garry and Trena were often frustrated by the red tape and the system that delayed the process. Their own unusual request to be given children of one family unit complicated the search. They signed up with adoption exchanges and reviewed the profiles of at least 2000 children before they found a family of five children they hoped to adopt. The children had been in foster homes and back in the parental home several times. When it was determined by the court that they could be adopted, the two girls were in one foster home and the three boys in another. Joey, the eldest, had been in four different foster homes and was at St. Joseph's Children's Home by the time Eidens were considered as adoptive parents. In May 1998 Garry, Trena, London, and Esjae went to visit the children and were told they could take them home in two weeks. Eidens took the children shopping and swimming before they came home to prepare for them to join their own family of four. But then they met with a major setback. Although the mother had allowed for their adoption, their father had to be informed and given a chance to come forward. After the mandatory 12-week newspaper notices in the Indiana town where he lived he did not contact the authorities and permission for their adoption was granted. For people like the Eidens who believe the Lord directs their lives, it was providential that these children had names and features that fit in with their own Tug, Tanner, Esjae, and London. Their prospective children were Joey, Germany, Eddy, Jacob, and Columbia. More than a few people have recognized that the children actually look like the Eidens. Garry says he felt a closeness to the children from the start - "they just fit". Trena admits that she had a harder time, maybe because she was at home with them all the time and had to deal with each crisis that arose out of their transition from their former life into a new situation. It may have been providential too that the children came to them one or two at a time. It gave Garry and Trena time to add on to their house. The addition added bedrooms and storage room they needed to accommodate a ready-made family. Social workers had prepared them for the worst scenario but they were not deterred. Garry and Trena went to a couple of training sessions and did a lot of reading. They learned that it has been determined that it is best not to put adopted children between the natural children. Again, it didn't seem accidental that all of these children were stair-stepped down from their youngest, London. Germany was first to come into the Eiden's home. That was October 9th, 1998. She'd met Garry, Trena, London, and Esjae earlier and she says she liked what she saw. She had felt a lot of responsibility for her younger brothers and sister so it took a load off her seven-year-old shoulders when she realized that Garry and Trena were making it possible for her family to be together. Two months later Eddie, nine months younger than Germany, came to stay. He told me it was kinda scary. He had to leave his little brother behind in the foster home where they had been together. His sisters had come to that home for his birthday but not often otherwise so he was glad to know Germany would be in their new home. Then Joey came for Christmas and both families had a rough time. Joey had gone from home to home in his nine years and, like Germany, had felt a responsibility to look after his brothers and sisters but wasn't able to carry such a burden. He had little hope that he could come to this family and never be uprooted again. This little troubled boy gave the family cause to wonder if this was going to work. As Tanner told me, that visit made them leery of having Joey come permanently. Eleven mouths to feed! 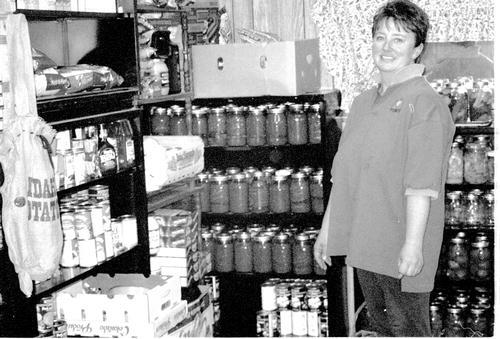 Trena in the Eiden family pantry. On January 9th, Columbia who was two years old, came to live with the Eiden family. This adjustment was very easy for everyone. Columbia is a little sweetheart and captured the hearts of her new family members and was already dear to her own brothers and sister. She was too young to have experienced the disruption that the other children had been through. Joey's transition into this family's life began in earnest on the 29th of January when he came to stay. It has been hardest for Joey but you wouldn't know that if you saw him now. He's a handsome young fellow, blond and blue-eyed, speaks softly, and seems a little shy. He seems to have let go of the past. He'd missed his brothers and sisters during the times when they had been separated. He found it harder to fit in with older brothers and a sister - he'd been the oldest before. Like the others, Joey has learned that he is accepted and loved and now that the six months of waiting for full adoption has passed, he can relax and know that this truly is his home and family. Jake, who was five at the time, came to live with the rest of the family in April 1999. Jake said he had lived with Eddy in a foster home but didn't know his brothers and sisters very well so he had to adjust to them as well as to his new family. I asked London and Tanner how it was for them to bring several children into their family. London says that mostly it was "cool". She did say she hesitated about sharing some things, like her stereo but most of the time it was okay. She even gave her Barbie dolls to her younger sisters. She learned that they didn't have to share everything; some things were their own private property. Tanner said he was pretty unsure at first. It was exciting but frightening. He found some of the children easier to adjust to than others. He was honest in saying that Joey's behavior on that first visit worried him. However, Tanner hopes he has been a good role model for the younger ones because he doesn't feel like he has much choice. As an older one in the family, the younger ones look to him to set the example and what he does influences them. He added, "Now that we have them, I can't imagine not having them." Esjae commented to his mother that even if he had children of his own someday, he would like to adopt a boy and a girl. From his easy camaraderie with the other kids, it is plain to see that he accepted their presence in his home. I didn't have an opportunity to talk to Tug because he is in college, however Trena and Garry said it hadn't been very easy for Tug at first. He felt that the kids disrupted the family harmony and there were behavioral problems that took a lot of energy. When he felt less threatened by their presence he became their big brother and grew to love each of them for the people they are. 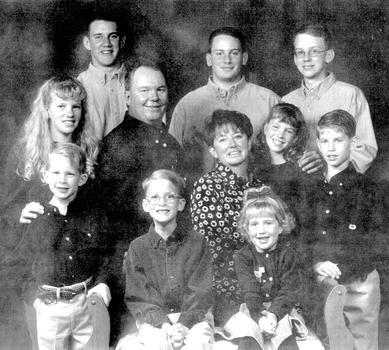 As for Garry and Trena, they admit to some rocky times when they wondered if they were damaging nine precious lives. Taking children from one lifestyle and trying to mold them into another took perseverance and a belief that no matter how bad things seemed to be, it was better than what the children had had before. A gradual process of teaching their code of behavior, instilling security into children who had not known it before, and maintaining their own children's sense of security is still demanding their energy and efforts. The Eidens believe in talking out problems; that wasn't easy for some of the children. Earning the children's trust and building their confidence to understand that "failure is not permanent" grows with each next experience at home, at school, and at church. It has taken time and patience to help these children understand that even though they mess up, they won't be taken away. Trena says children in "the system" are constantly analyzed. She wants her children to know that they are okay just as they are. She and Garry assure them they are loved and were chosen to be part of the Eiden family. They remind their children that their mother loved them; she just couldn't take care of them. When I visited with the children it was clear that they are happy young people. None of them seemed to remember that things had been bad for them (and things were bad or they wouldn't have been in the Family Services and adoption systems). They are very well behaved and kind to each other. Credit goes to their mother, their foster families and anyone who instilled kindness into their personalities. After Garry left with the older children for a cookout with other young churchgoers, the five young children fixed their Sunday evening snack and cleaned up the kitchen. The only time Trena said anything was when she reminded them the floor hadn't been cleaned properly. To me she said that they understood if they didn't do a chore right the first time, they had to do it again. No one complained. They took their showers and gathered blankets so they could have a "sleepover" in one of the bedrooms, as they love to do. Since Eidens don't have TV or allow computer games, the children read a lot, build things with legos, or watch approved movies on their VCR. Garry and Trena are disciplinarians - strict but tempered with love. The children have responsibilities to help with whatever needs to be done. Traditions are becoming part of the children's lives and they have come to expect that Trena will bake each one a favorite pie for Thanksgiving, that morning devotions are the norm, and that a lot of pictures are recording their childhood. Most of the Eidens enjoy participating in sports, music, 4-H, and scouts and the young people are learning that priorities must be set so that there is a balance and not too much stress on anyone. They go to church with their parents. They are all doing well in school. It was apparent to me that the family has weathered the worst storm of making two families into one. Trena said that each child, except Columbia who can claim all of them, has an animal. They have two parakeets, two turtledoves, one hamster, a turtle, a malamute, a cat, three fish, and two rabbits. "Everything except a partridge in a pear tree," Garry adds with his wry humor. The family doesn't travel much anymore but they go camping and enjoyed a week in Minnesota last summer. Whatever they do, they do together. Garry and Trena say that financially, it's tough. Friends and family have supplemented the meager duffel bag contents that came with each child. They can and freeze food. They are thrifty. However, they never mentioned that it was a sacrifice to take on five children when they already had four of their own. They did say that they didn't listen to the people who tried to discourage them. How have they done it? They trusted that the Lord sent them these children. They said the process was hard but it was worth it. And, their decision to adopt had nothing to do with what the judge told them after they had been made the adoptive parents. He said he was sure they had no idea how much money they had saved the state by taking in children that had to be fed, housed, clothed, and educated by people who were being paid to take care of them. Another saving grace - they have kept their sense of humor. It got them through a lot.